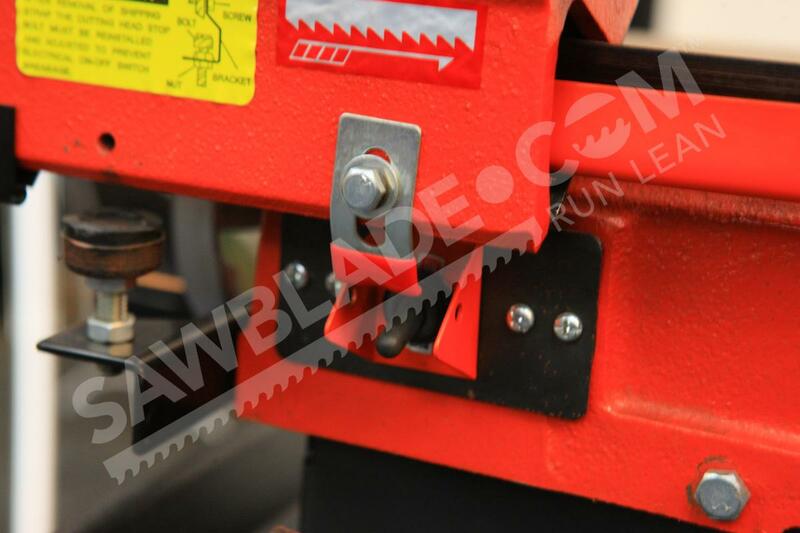 Blade Length: 93 x 3/4"
4 3/4" X 4 7/8"
When purchasing a band saw, you are often forced to choose between power and portability. Do you want a machine that can handle heavy-duty applications or one that can be easily moved from place to place without a forklift? With the Trajan 712, your can get the best of both worlds. Its solid casting body means it can handle some of the toughest jobs. Its roller wheels means its easy to move around the workshop – and even to a worksite. 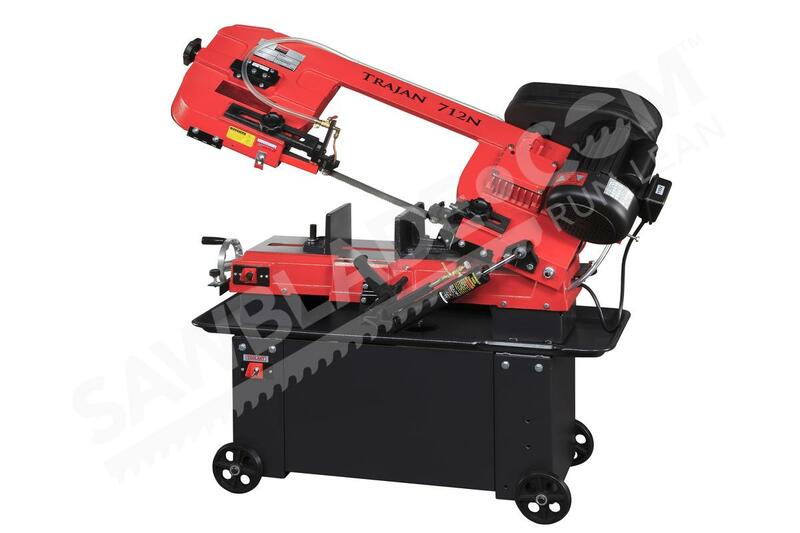 The Trajan 712 is multi purpose band saw that can cut a wide variety of materials. 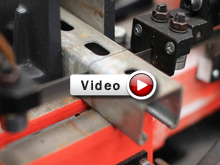 It has four belt speeds, which give operators great control over the cutting process, enabling them to handle a variety of different materials. For harder metals like Inconel, for example, operators can keep the speed slower. 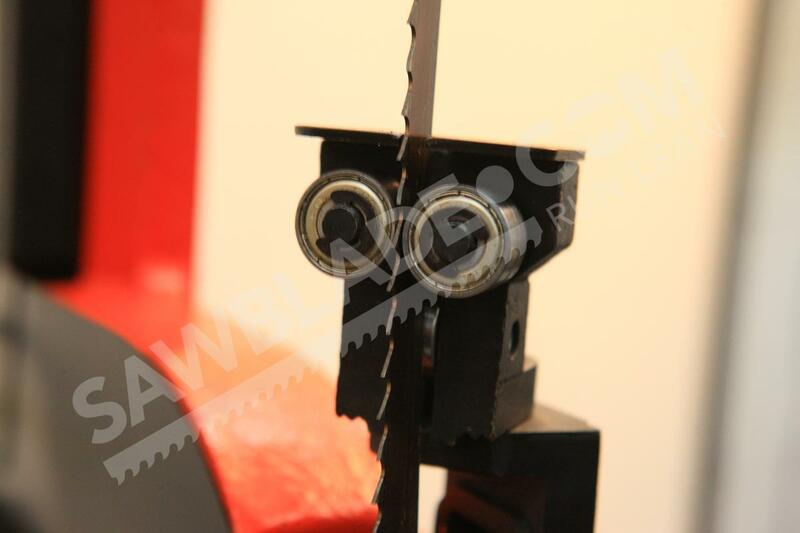 For materials that aren’t as heavy or hard, the saw can cut quickly and achieve an equally accurate cut. The Trajan 712 features a hydraulic downfeed control that lets operators make adjustments on the fly, meaning they can handle larger jobs more efficiently and improving the workshop’s cost per cut. Additionally, the Trajan 712 can cut from 0-45 degrees, which affords operators good flexibility when make a range of cuts. Operators can also switch out the arms, allowing them to make adjustments as needed. This feature has the added benefit of helping to improve blade life. 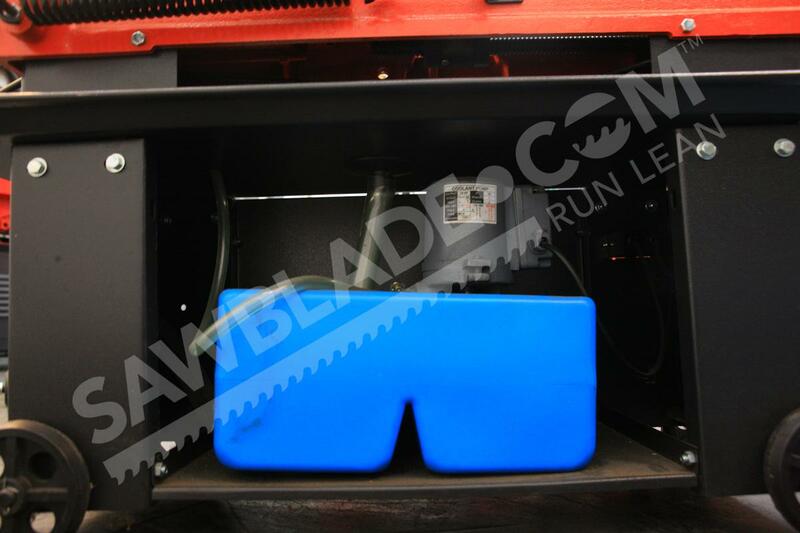 The built in coolant system also helps to increase that blade life, as it keeps the system from overheating and getting damaged. Furthermore, the Trajan 712 only requires an 110 volt connection, meaning it can be used in the standard electrical sockets found in most businesses and homes. 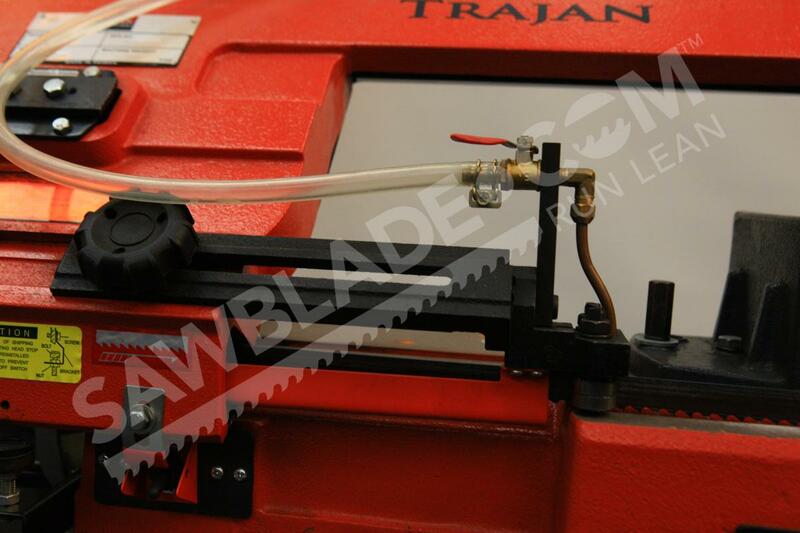 The Trajan 712 has standard maintenance needs: Operators should follow the standard protocol, keep the saw clean, and regularly clean out the chip brush and tray. As fluids deplete, they should be replenished. Keeping up with maintenance helps lower repair costs and ensures the Trajan 712 stays in good working order. This saw comes with an all-purpose blade, which MST guarantees will fit a variety of cutting needs. 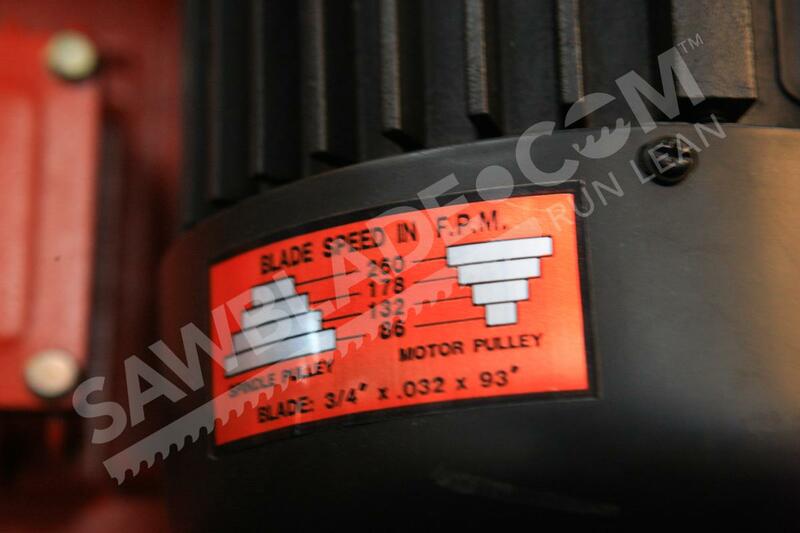 If you have any problems with your 712, call your Sawblade.com sales representative. They can provide technical assistance or even come out to your shop and trouble shoot. Contact us today to invest in a Trajan 712.